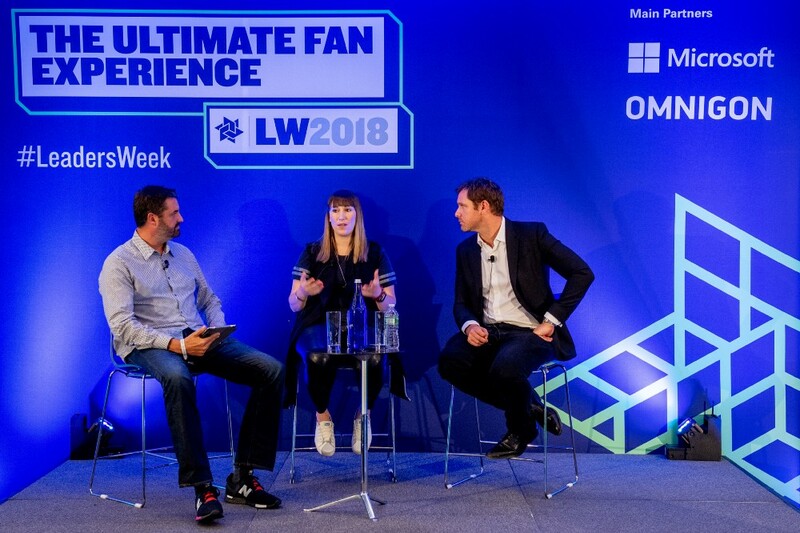 The incentive based sponsorship model that is creating waves in the sports sponsorship industry, was one of the subjects discussed during the Leaders Week, New York. Leaders from across the sports ecosystem gathered to share their thoughts on major topics impacting sports business, such as sponsorship, digital, technology, fan experiences, content, broadcast, transformation and others. Visa, the global payments technology company, has an incredible array of sports sponsorships worldwide. It is the top-tier sponsor of three of the world’s major sporting events this year — the Super Bowl, Pyeongchang Winter Olympic Games and the FIFA World Cup at Russia. 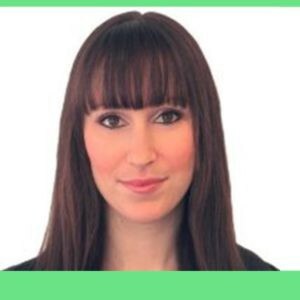 CRO Kimberly Cook of Hookit spoke to Chris Curtin, Chief Brand & Innovation Marketing Officer of Visa, on the philosophy, approach and execution of Visa’s sponsorships. On Visa’s approach to it’s sponsorships: Visa considers its associations with the Olympics, World Cup and NFL not as sponsorships but as collaborative partnerships. These sporting events are considered as the official moments to display the best of Visa and to showcase what’s yet to come. On it’s approach in choosing athletes to sponsor: Visa takes care in picking athletes that represent Team Visa, by looking at their character, story and relationships beyond the games. The Nigerian women’s bobsled team, who trained for the Winter Olympics by building their own wooden bobsled named “Maeflower”, is a classic example of Visa’s athlete sponsorship. Visa wants consumers to associate these values and work ethics with their brand. “To see that story come to life and to see how amazing these 3 women are, well beyond athleticism is remarkable. 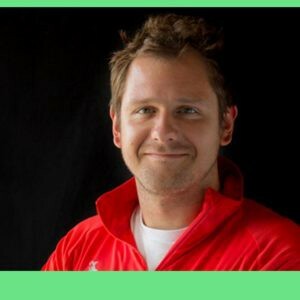 And thats the type of stories that we like to bring to life” — Chris Curtin on why Visa sponsored the Nigerian women’s bobsled team. On the criteria Visa looks for when partnering through sponsorships: Visa looks for platforms and channels that can drive not just awareness, but understanding and preference for the brand. It also prefers partnerships with companies most adjacent to what Visa does best (eg. in industries such as Food & Beverages, ticketing). On Visa’s approach to its sponsorships from an advertising perspective: Visa is moving its advertising towards digital platforms, to attract younger demographics and to create immersive experiences. Digital platforms also enable advertising assets to be more liquid and can be used across platforms/channels more easily. Visa’s advertising strategy also involves utilizing its relationships with sponsored athletes and bringing the brand to life through them. On how Visa’s payment technology has helped sports evolve: Visa wants to make payments seamless, secure and fast without taking away the sports viewing experience — creating good impressions on its customers as well as for its sponsored properties. CEO of Hookit, Scott Tilton, spoke to Georgia Sapounas, Digital Director of Canadian Olympic Committee and Dan Barnett, Chief Commercial Officer of US Ski & Snowboard Association about how they drove next level digital engagement during the Winter Olympics 2018 at Pyeongchang. Team Canada had one of the most successful Winter Olympics, winning 29 medals and finishing third overall in medal standings. 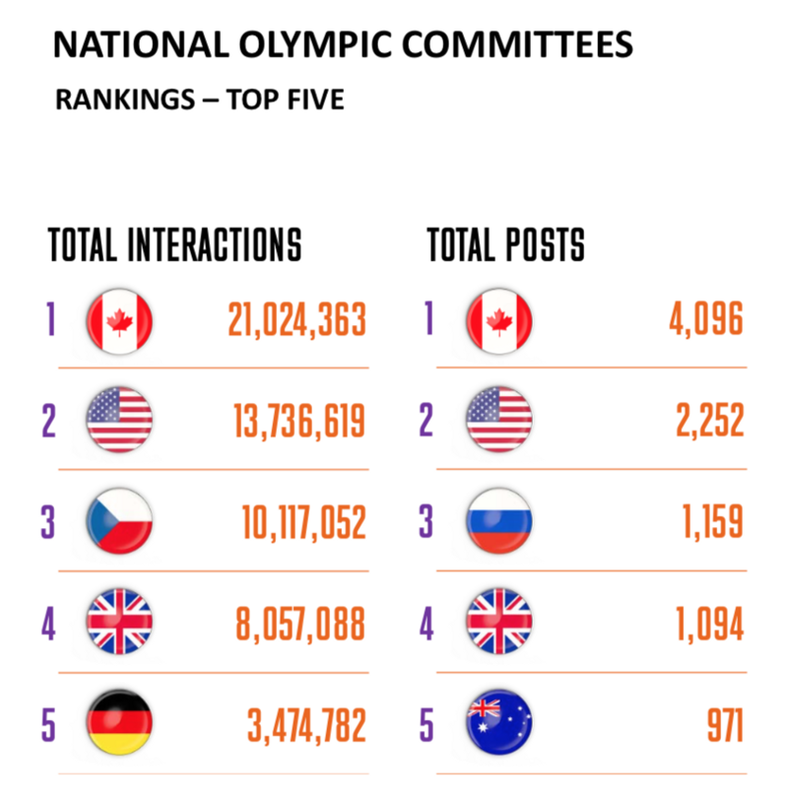 On social media, the Canadian Olympic committee was the most-engaged NOC with 21 million interactions across its social channels. With 4096 posts across its social channels, it was also the most active NOC on social media during the Winter Olympics. The digital team of COC had a whole game plan prepared in advance of the Winter Olympics. With a 14 hour time difference between Canada and Pyeongchang, the major strategy that the COC used was to own the morning and extend the evening, hitting a 24 hour content cycle to drive engagement. Hundreds of pre-cut videos were prepped and interspersed across all their platforms, particularly as Instagram stories. COC also used Hookit’s social media dashboard in real time to track the performance of their social media posts and made necessary tweaks to keep the social engagement in tune with the team’s overall goals. Instagram, Instagram stories and Facebook Live were the platforms the COC most focused on, with the key goal of driving more engagement. COC was successful in this strategy — the Team Canada Instagram account added more than 100,000 fans and total Instagram Story views surpassed 13 million and garnered 23.5 million engagements. The COC used powerful athlete storytelling and compelling content to increase fan engagement on their social platforms. The athlete stories of Tessa Virtue, Scott Moir, Justine Dufour-Lapointe, Mark McMorris and short track speed skater and closing ceremony flag bearer Kim Boutin, were the most inspirational and popular, delivering 21 million engagements across Team Canada’s social channels. Team Canada generated 1.6 times more social media interactions than Team USA, despite having less than 1/3rd of Team USA’s total social media followers. With a well planned social strategy, consistent messaging and real time social media monitoring, Team Canada drove high value for their existing sponsors. Also, based on the successful Winter Olympics social strategy, the COC could provide more recommendations and better strategies to increase sponsorship value for new sponsors. The US Ski & Snowboard Association has some of the best-known and most marketable Olympic athletes in the United States. American skiers and snowboarders won 11 of the 23 medals during the Winter Olympics — including five golds from snowboarding and freestyle skiing. USSA’s social strategy revolved around the timing of the skiing and snowboarding events during the Winter Olympics. 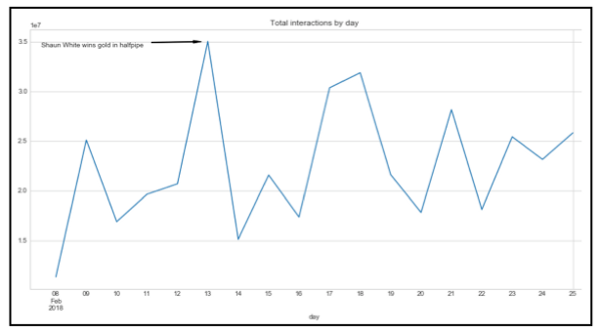 USSA was more active on social media when the US Ski and Snowboard athletes competed. 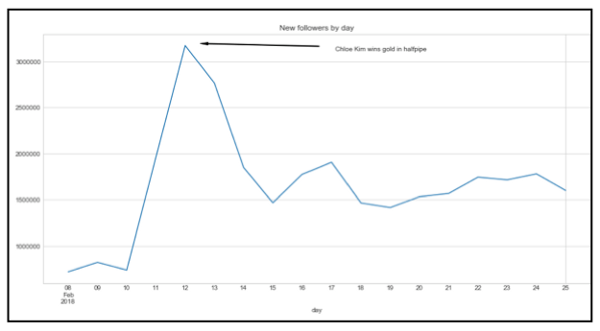 This strategy resulted in a marked jump in social media engagements — the day Shaun White won the halfpipe gold had the most engagements while the day Chloe Kim competed and won halfpipe gold led to the highest increase in followers. USSA has an athlete-focused, content-led storytelling model, as some of the best-known Winter Olympians in the country compete in skiing and snowboard events. Gold medal wins from popular athletes Shaun White, Mikaela Shiffrin and Lindsey Vonn, as well as breakout performances by Chloe Kim and Red Gerard drove higher than expected engagements on social media platforms. Some of the social KPIs that USSA focuses on, is engagement across its social media platforms and quality of its promoted posts. USSA already has long term partnerships with big brand names like P&G and Bose and the success on social media during the the Winter Olympics, along with access to consumers across all major demographics has made USSA attractive to newer partners. Both USSA and the Canadian Olympic Committee believe that sponsorship activation has changed dramatically over the past two years. Two years ago social media was not considered important for sponsorship activation. But now, sponsors expect rights-holders and athletes to integrate social media as part of their sponsorship strategy. Anheuser-Busch InBev dominates the U.S beer market with greater than 45% market share. Its signature brands Budweiser, Corona and Stella Artois are some of the best known beer brands globally. AB InBev is also one of the big spenders in sports sponsorships, with an estimated spend of $350M in 2016. 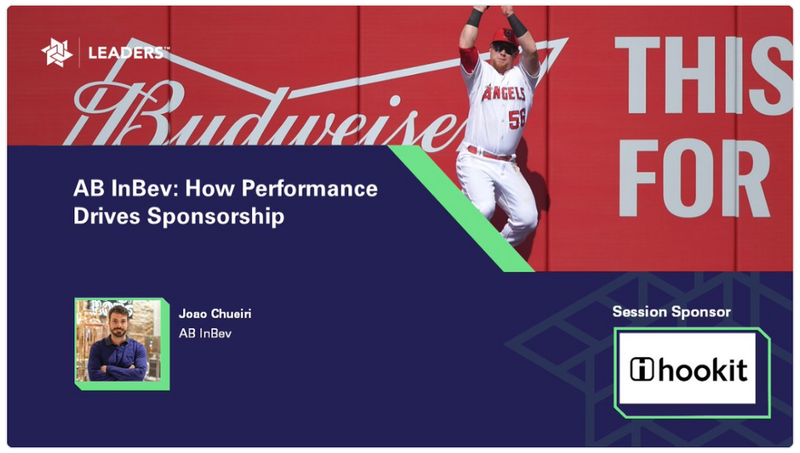 Recently, AB InBev created waves in the sponsorship industry when it announced that it was rolling out a new sponsorship model that provides incentives based on performance. 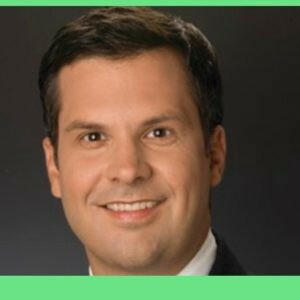 At Leaders Week, Joao Chueiri, VP of Consumer Connections at Anheuser-Busch InBev detailed the need and AB InBev’s decision to move towards performance based sponsorships. AB InBev has sponsored sports for over 50 years and continues doing so because of its belief that sports brings people together and that sports has huge passion and engagement compared to any other American pastime. However, there is now a marked shift in consumer behavior. Sports has been the most important American pastime for many decades and beer has been synonymous with sporting events. Recently, there has been a drop in beer consumption at sporting events due to increased consumption of wine and other spirits. People now consume media through different channels, viewership and live attendance are down across the board and more than 55 million Americans have no cable subscription. Also, Millennials, one of the key demographic segments for AB InBev, prefer to spend money on experiences such as festivals and live events and not just sports. The challenge that AB InBev now faces is to be meaningful, relevant and stay culturally connected. This shift in consumer behaviour was the driving factor for AB InBev’s incentive based sponsorships. In order to keep up with the changes in consumer behaviour, AB InBev had to start evolving in its deals and incorporate new metrics & KPIs to address its new objectives. With a wide variety of options such as esports, music festivals, art, fashion, etc., available to consumers today, AB InBev has to decide on the sponsorships which will result in maximum ROI and help them stay relevant and connected with the consumer. Therefore, AB InBev’s new sponsorship strategy aims to ensure that its partners are willing to commit to results and eventually help meet AB InBev’s objectives. Almost 95% of AB InBev’s partners have been retained after negotiation and the overall feedback has been positive. AB InBev built this sponsorship model after discussion with its partners, and with the incentive based model, partners are clear about AB InBev’s expectations for them and vice-versa. 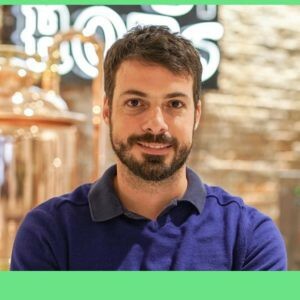 AB InBev believes that the incentive based model is the future and it also helps achieve the goals of both parties. Missed Team Hookit at the Leaders week New York? Meet us at Hashtag Sports in New York from June 25–27, 2018, to learn all about empowering your sponsorship intelligence. Did you know? Our brand new product Spontelligence is the only tool which simplifies your sponsorship process, and helps guide you through every step of the sponsorship cycle. LEARN MORE!